b. 1954, Haarlem (The Netherlands), Lives in Amsterdam Selected Performances, Exhibitions and Screenings include: 2012- IN:ACT. 3. International performance art event. Nhasan Studio, Hanoi, Vietnam. 2012- International Multimedia Art Festival. French Institute, Yangon, Myanmar. 2012- ASIATOPIA. Bangkok, Thailand. 2012- TransArt Communication. Nové Zámky, Slovakia. 2012- 13. International festival of performance art NAVINKI. Minsk, Belarus. 2012- INTERAKCJE. 14th International Action Art Festival. Piotrkow Trybunalski and Bielsko Biela, Poland. 2012- The Inevitable. 222Extern Lodge. SBK, Dordrecht, The Netherlands. 2011- Ill Repute. UNIT/PITT Projects, Vancouver, Canada 2011- Exchange Radical Moments! PAErsche and Die Fabrikanten. Orangerie-Theater, Cologne, (D) 2011- exist-ence. a festival of live art. Powerhouse and Metro Arts, Brisbane, Australia. (cat.) 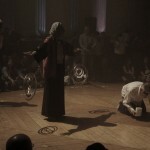 2011- TRANSMUTED festival internacional de performance. Ex Teresa Arte Actual, Mexico City, Mexico. 2010- Guangzhou Live 010. 53 Art Museum, Guangzhou, China. 2010- 3. 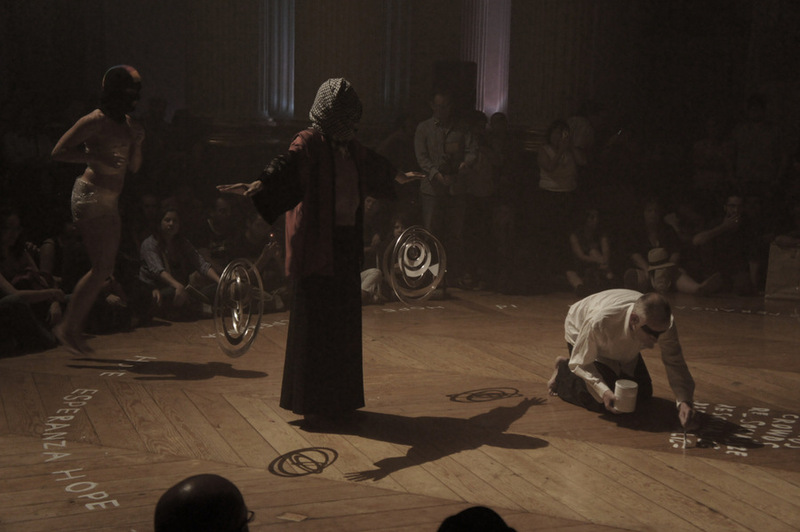 Performance Art Event (PAE3). Wolfart Projectspaces, Rotterdam, The Netherlands. 2010- Grace Exhibition Space, New York, US. 2010- Infr’Action 6. Sète, France. 2010- What’s new? Acquisitions. MMKA/Museum voor Moderne Kunst, Arnhem, NL. 2009- The manifold (after) lives of performance. Frascati theater, Amsterdam. Co-produced by De Appel Arts Centre, Amsterdam, NL and STUK, kunstencentrum, Leuven, Belgium. 2009- 3. Préavis de Désordre Urbain. Marseille, France. 2009- Made in Arnhem INVITES. 35 jaar kunstfestivals. MMKA/Museum voor Moderne Kunst, Arnhem, NL. 2009-10th OPEN International Performance Art Festival. 798 Art Zone, Beijing, China. 2009- INTERAKCJE. 11th International Action Art Festival. Piotrkow Trybunalski and Bielsko Biala, Poland. Blind Dates with The History Of Mankind finds a meeting ground between sensual bewilderment and political commentary which points out the constructed nature of our ideas of cultural memory and our sometimes superficial notions of identity. During “Currency 2004, an International Festival of Contemporary Performance” in New York, Peter BAREN started an ongoing series of performances entitled ARK (…), that has continued to evolve and change shape over time. It has subsequently been performed in the United States, Europe, Canada, Middle East, Asia and Central America. BDWTHOM is part of this multi-sensory series and practices the public assumptions of performance – the promise of drama, duration and theatricality – to evoke a disquieting sense of primordial mystery, public yearning, fear and cultural reformation. (Lance Blomgren). The involvement of the audience is triggered by mobilizing all the senses. It cannot and should not be that the spectators leave the location unmoved. 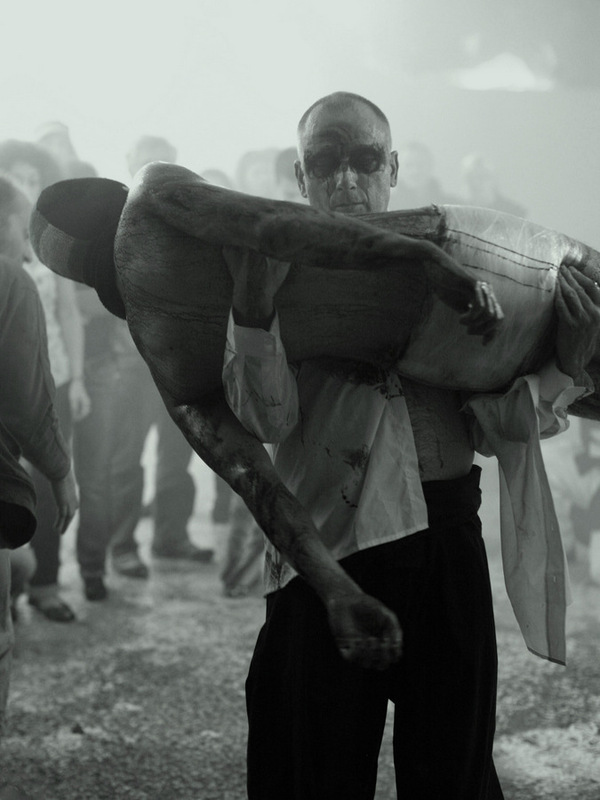 A performance by Peter Baren is not a visual spectacle, but an emotional experience. (Rob Perree).